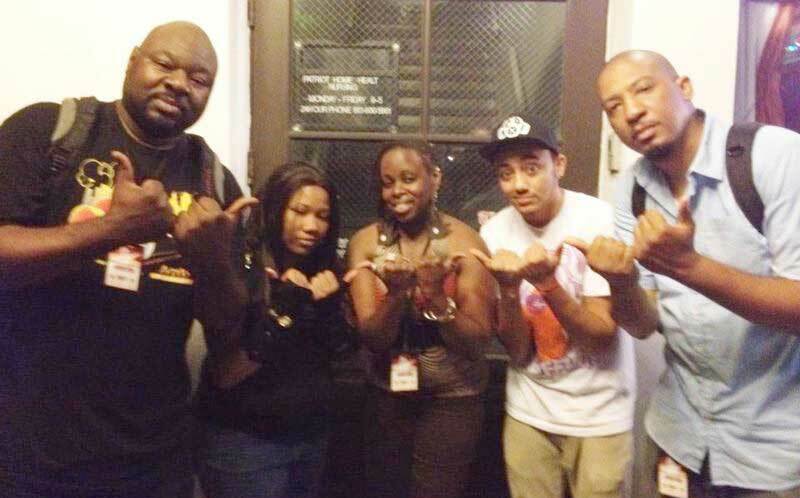 The 2012 Bull City slam team throws up the “bull horns” hand gesture. From left: Elliot Axiom, SLAP, Kimberly “Redefining Freedom” McCrae, Ishine, Dasan Ahanu. (Photo courtesy of Dasan Ahanu). Twelve poets. Three minutes. Four spots. At 8 p.m. on April 20, 12 of the Triangle’s best poets will compete to earn one of four spots on the 2013 Bull City Slam Team, which will represent Durham in the National Poetry Slam in August. 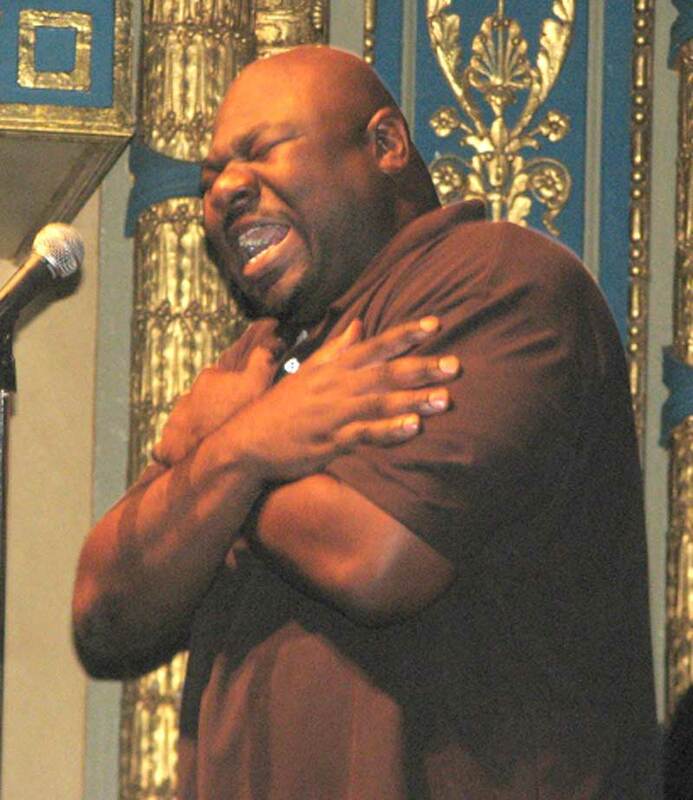 At Grand Slam Finals, top-scoring poets from the Hayti Heritage Center’s monthly Jambalaya Soul Slam will have three minutes to perform original poems to be judged by a panel of five audience members. The event will consist of three rounds with eliminations occurring each round. 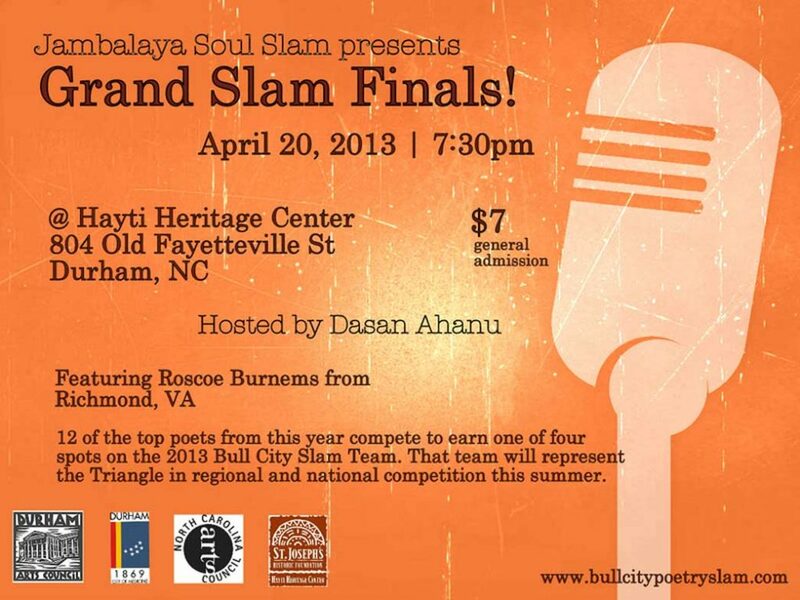 The four poets with the highest cumulative scores by the end of the third round will be selected for the 2013 Bull City Slam Team. 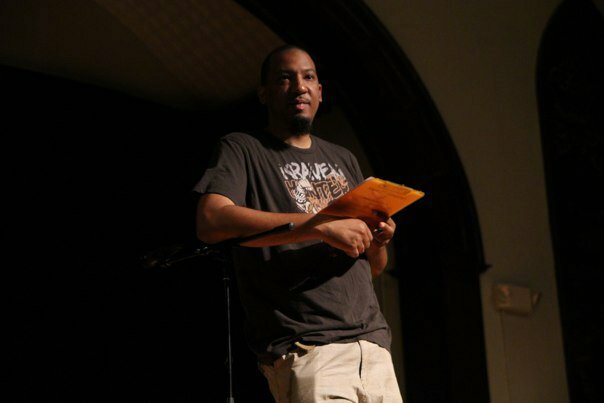 Dasan Ahanu, the founder of the event and coach of the Bull City team each year, said there is always a wide range of poetic content shared at the slams. Dasan Ahanu, the founder and host of the Soul Slam, keeps score of a poet’s performance. (Photo courtesy of Dasan Ahanu). Ahanu, who once competed nationally on the Charlotte slam poetry team, started the Jambalaya Soul Slam in Raleigh in 2002. The program moved to the Hayti Heritage Center in Durham in 2005 and has been growing ever since. With grant support from the St. Joseph’s Historic Foundation, the Bull City Slam Team has competed at various regional and national poetry competitions for the past seven years. Elliot Axiom, a finalist who has been on the Bull City team since its creation, said that while the slams are competitive by nature, poets primarily attend with the intention of sharing their work — and their stories — with an audience. Axiom said he used to perform with his eyes closed as a way of tuning out the audience during a performance but is now fairly confident performing his work in front of a crowd. Axiom said that the nature of how judges are selected for the event — at random from the audience — can make it difficult to predict who will score well in the competition and win a spot on the team. Elliot Axiom performs one of his poems. Axiom said he used to perform with his eyes closed as a way of tuning out the audience. (Photo courtesy of Elliot Axiom). Starr Seward, who was a member of the SlamCharlotte national championship poetry team in 2008, is competing for her first time in Durham. Seward qualified as a finalist in November, when she was also chosen to represent Durham in the 2013 Women of the World Poetry Slam. Seward placed 17th at the event, which brings together 72 of the world’s top female poets. Seward, who has qualified for WOWPS five times, said she looks forward to the event for the competitive aspect and for the chance to see fellow poets she has come to think of as family members. Kimberly McCrae, a fellow finalist who was on last year’s Bull City Team, said the poetry community is extremely close-knit, especially in North Carolina. McCrae, whose poet name is “Redefining Freedom,” is an advisor to the Duke University spoken word group Spoken Verb. McCrae said some of the young poets in the community call her “Aunt Freedom,” and she looks on some of them as her children. McCrae said it’s only been in the past couple of years that she has felt comfortable enough to share personal, often painful stories through her poetry. McCrae said she was in an abusive relationship for many years and struggled to find her identity. McCrae said her poet name, “Redefining Freedom,” is representative of the new identity she has created for herself in acknowledging the past and moving on to the future. Her poems “Battle Scars,” “Cracked Mirrors” and “Love Letter to a Fractured Past” were all written from her experiences in the abusive relationship. Axiom said he, too, writes poems from personal experiences of love, loss and hurt. He began writing poetry in the seventh grade as a way to express what he thought he couldn’t articulate to anyone else. Seward also began writing at an early age, as an escape from childhood troubles. She now works for the Sacrificial Poets, a youth poetry program in the Triangle that gives middle, high school and college students the chance to write and perform poetry. Regardless of what happens at Grand Slam Finals on April 20, Ahanu said the poetry slam is so much more than a competition. Axiom said he will continue writing and performing poetry — even if he doesn’t make the Bull City Slam Team for his eighth consecutive year. 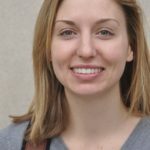 Reporter for the Durham VOICE and UNC-Chapel Hill student. Contact the Durham VOICE staff at thedurhamvoice@gmail.com. This entry was posted in Arts, Non-profits and tagged bull city slam, poetry slam. Bookmark the permalink.